A warm welcome awaits you at this family run farm set in the Sussex downland, only one mile from Beachy Head. We have probably the largest collection of sheep in the world with over 55 different breeds of sheep, many older breeds no longer seen on modern farms. Take a glimpse at our Agricultural heritage and history of sheep on the downs. There are lots of young farm animals including pigs, goats, calves, rabbits and chicks both outside and under cover to feed and cuddle, with easy access from paved walkways. 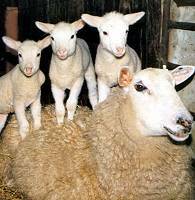 In the summer watch sheep milking, cheese making , shearing and spinning. Help bottle feed the lambs, browse around the farm shop where there is a wide range of sheepy gifts and prize-winning yoghurts and cheese.